Today's superfood is none other than quinoa; it had to come up in the list somewhere didn't it?! If you haven't heard of quinoa before, now is the time to listen up! According to WHFoods, the Food and Agricultural Organization (FAO) of the UN has officially declared that the year 2013 be recognized as "The International Year of the Quinoa." The first thing you are probably wondering is what is quinoa?! It looks like a grain but, trust me, it is so much more! Quinoa is technically a seed and it is rich in fibre as well as being a complete protein (containing all 8 amino acids). 100g of cooked quinoa contains approximately 4.5g protein, 2.8g fibre and only 21g carbs and 1.9g fat. The little amount of fat in quinoa (due to the fact that it's a seed) is unsaturated and full of omega 3, a great anti-inflammitory. Quinoa is gluten free, cholesterol free and nearly always organic. Quinoa is a good source of calcium containing double the amount than is found in whole grains. It is also a great source of iron, manganese and phosphorus. On top of all of these great nutritional factors, quinoa is quick and easy to cook and tastes great on it's own or mixed in with other foods. The easiest way to cook quinoa is like rice; 1 part quinoa to 2 parts rice. It takes only 10-15 minutes to cook, turning translucent with spiral tails when it is ready! Something I quite often do when I am cooking quinoa is dry roast it first; it gives it a great nutty flavour. Now your are probably thinking...this sounds great but how can I include quinoa in my diet? Well, there are so many ways! It is such a versatile ingredient! Quinoa is a great healthy substitution for rice, as a side or in a risotto or paella; you can use it instead of pasta; use it in salads; mix it with roasted veg; use it in a pilau; use it to stuff peppers or root vegetables; even use it in porridge or for baking as with the Martha Stewart Recipe here. Below are a few meal ideas for quinoa, I've just realised most of these are with fish but if you are a vegetarian/ vegan, it's easy to substitute the fish for other ingredients such as puy lentils, beans or just more veg! This recipe is so simple and can have so many variations; why not mix in some prawns, cooked chicken or fish? As you will notice, it is extremely similar to yesterdays first recipe! 1. As with yesterdays recipe, toss the vegetables with the oil, salt, pepper, garlic powder, basil and oregano in a metal roasting dish. Place in a preheated oven at 180 degrees for 25 minutes. 2. While the veg is roasting, rinse the quinoa before adding to boiling water. Boil then cover and simmer for 15 minutes. 3. 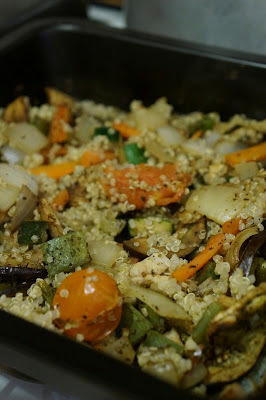 When the quinoa is ready, drain off any excess water and, if you have timed it perfectly, mix in with the roasted veg. 4. Serve with lots of freshly squeezed lemon and toasted pita bread (you don't have to have this of course but that's the way I eat it)! You may have seen this recipe before; it's one I stole from my mother! As mentioned above, the fish can be taken out to make this a vegan recipe. 3. Add in the quinoa and stir to coat in the oil before adding the wine. *I'll note here even though I shouldn't as this post is about quinoa...the quinoa can be subbed for rice to make the dish shown below (I just wanted to put on my better photo! haha). 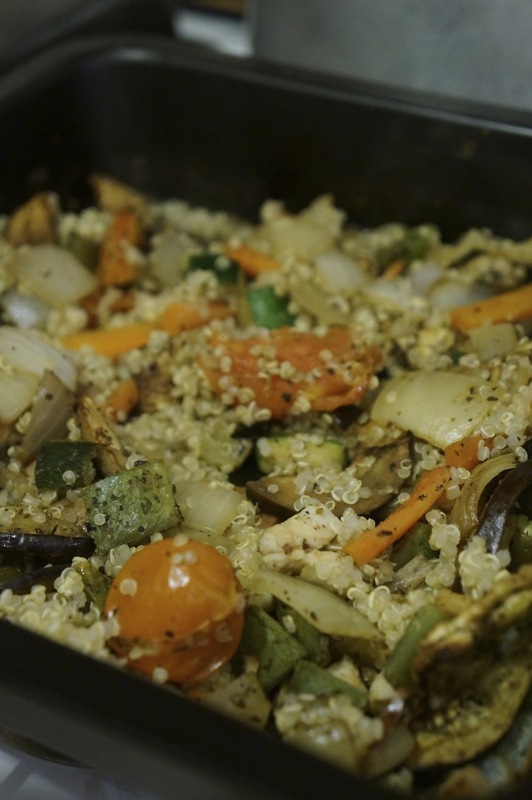 The quinoa part to this recipe is extremely simple and is a great side to add to any dish. Last time I made it, I had it with salmon so I'll also put the recipe for that below. 1. If cooking the salmon part, wrap salmon (drizzled with a bit of sweet chilli sauce) in tinfoil and bake in a preheated oven at 180 degrees for 25 minutes. 2. Meanwhile, rinse the quinoa before adding to a pan of boiling water along with the frozen veg. Boil before covering and simmer for 10 - 15 minutes until the quinoa is cooked. 3. In a wok, heat up the passata, tomato puree and other remaining ingredients for 5 minutes or so until a thick sauce is achieved. 4. Drain the quinoa and veg and serve in a small dish. Take the fish out of the oven and serve topped with the tomato sauce. Have you tasted quinoa before? Would you class it as a superfood? Which recipe above do you like the sound of? Or have you got any more recipes to add?